Atlanta, November 13, 2018 – Advance tickets for “Yayoi Kusama: Infinity Mirrors” at the High Museum of Art are sold out. A limited about of tickets (about 100) will be available on-site at the Museum each day for walk-up purchase beginning on Nov 18. Those tickets will be available on first-come, first served basis and will be valid for that date only. The exhibition provides visitors with the unique opportunity to experience six of the artist’s Infinity Mirror Rooms – her iconic kaleidoscopic environments-as well as additional large scale installation, sculptures, paintings, works on paper, and archival photographs and films from the early 1950s though the present. The exhibition features numerous new works by the 89 year old artist, who is regarded as one of the most influential artists of the 20th century and is still very active in her Tokyo studio. 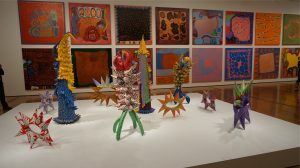 New works include vibrantly colored paintings and the recently completed infinity room “All the Eternal Love I Have for the Pumpkins” (2016), featuring dozens of Kusama’s signature bright-yellow, dotted pumpkin sculptures. Spanning the entire second floor of the High’s Wieland Pavilion, the exhibition allow visitors to take once-in-a lifetime journey though more than 60 years of Kusama’s creative genius. The exhibition begins with the artist’s original landmark installation, “Infinity Mirror Room- Phalli’s Filed”, featuring a vast expanse of red dotted white tubers in a room lined with mirrors, which create a dazzling illusion of infinite space. The exhibition also features “Infinity Mirrored Room-Love Forever”, a hexagonal chamber into which viewers peer from the outside to see colored flashing lights that reflect endlessly from ceiling to floor. The work is a re-creation of Kusama’s legendary 1966 mirror room “Kusama’s Peep Show” in which the artist staged group performances in her studio. Kusama’s signature bold polka dots will be featured in “Dots Obsession-Love Transformed into Dots”, a domed mirror room surrounded by inflatable suspended from the ceiling. 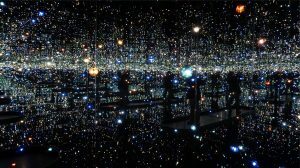 “Kusama’s Infinity Mirror Rooms open onto places within the imagination that are beautiful and transcendent. Like sensory deprivation chambers, they leave the viewer grappling to reconcile the totality of the cosmos with a sense of microcosmic infinity within the body,” said Michael Rooks, the High’s Wieland Family curator of modern and contemporary art. Also on view in the exhibition is a selection of more than 60 paintings, sculptures and works on paper, including many of Kusama’s infrequently shown collages, which she made after returning to Japan following a stay in New York City from 1957 to 1973. These works trace the “Accumulation” assemblages to recent paintings and soft sculptures, which highlight recurring themes of nature and fantasy, utopia and dystopia, unity and isolation, obsession and detachment, and life and death. The exhibition will conclude with Kusama’s iconic participatory installation “The Obliteration Room”, an all-white replica of a traditional domestic setting. upon entering, visitors will cover every surface of the furnished gallery with multicolored polka dot stickers to gradually engulf the entire space in color. The exhibition will be on view at the High from Nov 18, 2018 though Feb 17, 2019.